I’m hereby declaring this my favorite meal of the summer! Except for garden-fresh tomatoes. And burrata. And anything that remotely resembles some version of caprese. And fresh, buttery lobster rolls. But other than that, THIS is the meal of the summer! Yes, it’s carbonara, but it’s totally light and delightful. You just need a small serving. It’s super satisfying and tastes INCREDIBLE. With a salad to start and an ice cream cone to finish, there is no other meal needed to get you through the end of August. The shrimp? It’s cooked in a touch of the bacon fat. 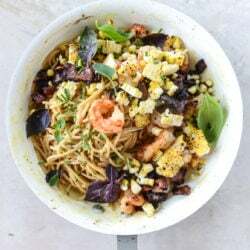 The charred corn is tossed along with those crunchy bacon pieces and ridiculously flavorful shrimp, mixed with whole wheat spaghetti and the parmesan + egg mixture. It’s rich. It’s pretty! It’s embarrassingly easy to make on a weeknight too. I love making carbonara in our house because even with just the bacon alone, Eddie considers it a full meal. I mean, that’s huge. The fact that there is no chicken or steak in traditional carbonara? And he still deems it acceptable? Big win. Yes, we are still talking about this in 2016. I live it every day. Soooo – he obviously went super crazzzzy over this version with shrimp. Starting eating it straight out of the pan the moment he got home from work and all that jazz. We actually ended up having a huge fight about it, which is kind of hilarious now. Sort of. I made him sit down and eat dinner while listening to some Steve Tyrell and watching Max throw his shrimp all over the floor. It was the most romantic ever. Bring a large pot of water to a boil first for your pasta. While it’s heating, start the bacon. Heat a large skillet over medium heat and add the bacon. Cook until totally crispy and the fat is rendered. Remove the bacon from the skillet with a slotted spoon. Carefully transfer all but about 1 tablespoon of bacon fat to a bowl and set it aside. Keep the skillet over medium heat. Pat the shrimp completely dry with a paper towel. Sprinkle the shrimp with the salt and the pepper. Add it to the bacon fat and cook, tossing often, until the shrimp is pink and opaque, about 3 to 4 minutes. Transfer the shrimp to a plate. For the corn, you can either grill or roast it, use leftover corn, or prepare it the day before. You don’t need to char it if you don’t have time, either! To grill, I heat my grill on the highest heat and once hot, place the corn on direct heat, tossing often, for a few minutes until charred. To roast, I heat the oven to 425 degrees F and toss the corn occasionally on a baking sheet for about 20 minutes or so. Slice the corn from the cobs once finished. (As a note, keep an eye on your pasta water and begin cooking it soon.) Whisk together the eggs and grated parmesan. Add the bacon fat back to the skillet. Heat the skillet over low heat. Add the garlic cloves and stir, cooking for a minute or so. Add the spaghetti to the skillet and toss it well in the bacon fat. Remove the skillet from the heat. Pour in the egg/parmesan mixture and stir and toss quickly and constantly to create a creamy sauce, tossing for 3 to 4 minutes or so. Add in the bacon, shrimp and corn. Sprinkle with chives, basil and fresh oregano. Sprinkle with extra parmesan too. Serve! I would sell my soul for that bowl. I’m allllll about charred corn, and I know the feeling of having to include meat in every.single.meal. If and when bacon pieces count as the meat, that’s a huge win! Except it’s actually way better with shrimp+corn I imagine. the corn is so, so wonderful right now! The combination of the shrimp and pasta with corn and bacon is too good to be true! I love that you’ve been posting so many corn recipes! It seriously is one of the best parts of summer. this sounds like the perfect balance between rich, hearty carbonara and sweet, light summer flavors! plus, i can never get too much of shrimp. I hear you on the whole thing if there is no meat, its not really dinner. To my husband, if there is no animal protein it is just a side dish. I made your favorite shrimp scampi (in 2010) on Monday, which we love in the house, ate leftovers last night and today for lunch, ah so good. But, craving this so bad and I’m sure it will be as satisfying, if not more. i love that you still love that! when i looked at the figure of 14766 dollars .Than I have no other choice but to accept , what i saw .They have been doing this for a year and get rid of their debts.. Yesterday they purchased new Aston Martin ……. Oh my gosh, this is summer. The very fact that you used bacon fat to saute everything tells me that we are soul sisters. That and CHARRED CORN. Bring it on – super huge heart eyes. But I have to wonder what exactly you and Eddie fought about…was it eating standing up, or eating all the blog fodder? My hubby has the same habit! Does Max eat everything you make? If not, what do you do instead? Can you do a post about dinner with Max?? I always want to make your dishes but my toddler doesn’t eat about 80% of the things I make. he mostly does – i do give him everything i make, within reason. like if we are having something really spicy or just chicken caesar salads or something i might give him some leftover pasta. but i don’t cook him separate dinners, i always just give him what we are having. some nights he is pickier than others. i might do a post about lunchtime meals on the baby page which would have some ideas!! This looks so good! I love the idea of throwing the corn in there. Gotta squeeze corn into any recipe while it’s still in season! This looks amazing! I could definitely make this on the weekend. Love your recipes! This looks incredible!!! Making it tonight! Thanks for such a great recipe! I just discovered your blog and am so glad I did! I finally got someone to tell me how to roast corn in the oven. I live in a condo and don’t have a grill but I love grilled corn. I will definitely be making that this week for sure! 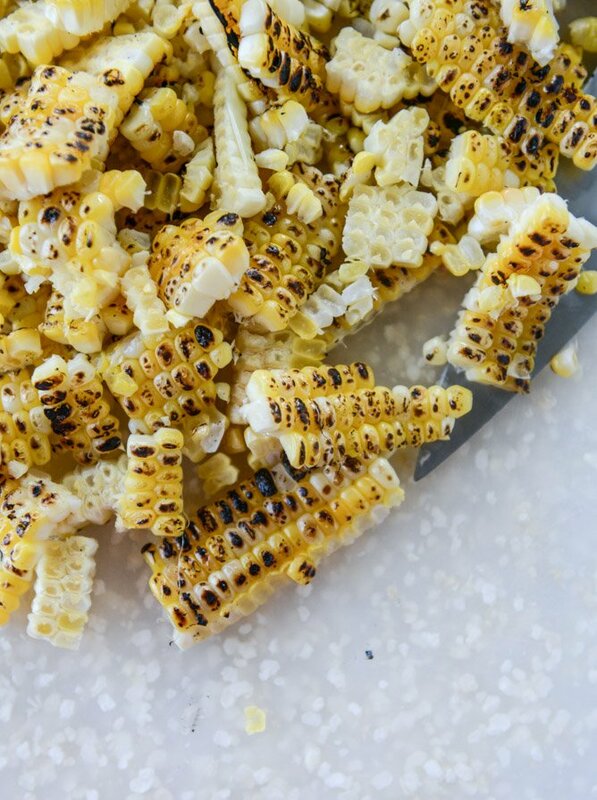 My other favorite is Mexican Street corn, have you made that and do you think it would be as good in the oven? My mother made this dish for a dinner party and they loved it. Thank you so much! I just made this tonight, as part of my end of summer rush to eat as much delicious seasonal produce as I can. It was fantastic! 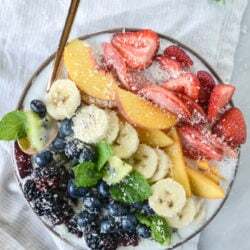 Thank you for such clear instructions – somehow it was both creamy and satisfying, while still feeling light for summer eating. The fresh basil is definitely a must – I almost left it out because I get lazy when it comes to finishing things off with fresh herbs when its just my husband and I, but I’m so glad I didn’t. Thanks for all you do! I just made this for dinner tonight and it was AHHHHMAZING!! I substituted cubed chicken breast in place of the shrimp because that was what I had on hand but it was still fantastic! A new favorite!